Recent release “Healing Words, Healing Heart, For a Loving Soul” from Page Publishing author Nick Olsen is a beautiful assortment of poetry sure to create earnest reflection and foster a global community of Spirit. 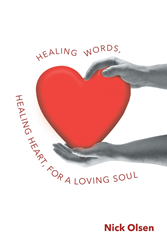 Nick Olsen, a dedicated writer and advocate of meditation, has completed his new book “Healing Words, Healing Heart, For a Loving Soul”: a calming and spiritual assemblage of poetry sure to offer inspiration and hope. He began his own spiritual quest twelve years ago, just after his father died, in order to answer for himself questions he had about his own life. Through meditation he found he could bring himself to a level of peace, harmony and calmness from which the answers he sought easily came. Published by New York City-based Page Publishing, Nick Olsen’s appeasing poetry collection was written to bring words of hope, encouragement, unconditional love, and understanding to all people. The messages included reflect the soaring highs and wretched lows that all are sure to face in life, but they offer inspiration and encouragement. The verses will help the reader grow and hopefully endeavour to comfort others and restore their spirit. Readers who wish to experience this powerfully inspiring work can purchase "Healing Words, Healing Heart, For a Loving Soul” at bookstores everywhere, or online at the Apple iTunes store, Amazon, Google Play or Barnes and Noble.